Google recently introduced a compelling new ad extension for their paid search ads. This ad extension aptly named “message extension” allows users to send your dealership a text message directly from a paid search ad. This ad extension allows the dealership to create an open dialogue with the customer through a user-friendly method of communication. This method of communication allows the user to communicate with the dealership on their own terms and using a method of communication that they carry with them everyday in their pocket. Message extensions present a new platform for dealerships to interact with customers and potential customers. This ad extension is a powerful way to engage on-the-go smartphone users and bring the user from contact to conversion quickly. Your dealership will have the ability to schedule these extensions so they will only be shown alongside your ads during the hours when you’re available to respond to text messages. Each of your campaigns can have a different message extension. This means texts from message extensions can be sent to different dealership contacts for new, used, service, credit and so on. With message extensions, you’re charged the same CPC as if someone clicked your ad and visited your website. Meaning, you would only pay on average $1.50* to have someone directly contact the dealership. Basically what I’m saying: message extensions mean $1.50 cost-per-lead. Yes you read that right, the potential for $1.50 cost-per-lead. Most dealerships are already featuring text message communication in their website chat so preparing to manage message extensions should be a simple step for most dealers. The one fall back, for now, Google isn’t able to track conversions on text messages so your dealership will have to track conversions from message extensions internally. This ad extension will require your dealership to ensure you’re responding to text message inquiries efficiently during the hours your extension is scheduled. 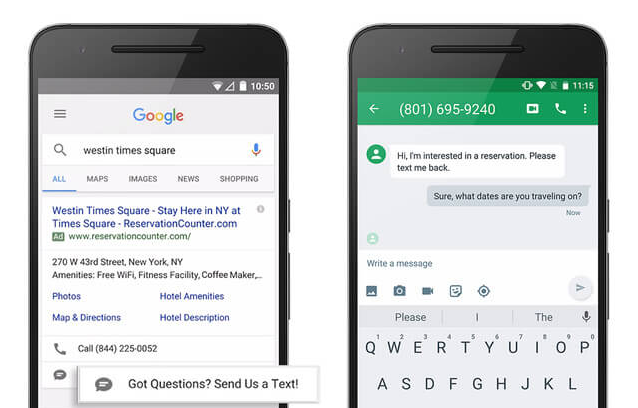 Want to try message extensions on your search ads? Get in touch with us, we’ll get some information from you to make sure you have the resources in place to support message extensions and get them live!